Snow can be a wonderful thing—until it buries your car, prevents you from opening your front door, and ensures that you won't be going anywhere for at least a week. Curl up under a blanket and pray that you don't see as much snow as fell during these winter storms. The Great Snow of 1717, when the colony of New York and New England was blanketed by at least 9 ft (2.7 m) of snow. About the half of it fell during one single snowfall. The Great Blizzard of 1888, caused 20-60 inches (51-152 cm) of snow in New Jersey, New York and in parts of Connecticut and Massachusetts, with winds up to 45 mph (72 km/h). It resulted a deaths of about 400 people. 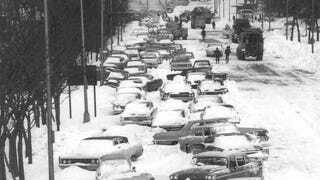 The Blizzard of 1977 in January 1977, hit Western New York and Southern Ontario. 100 in (254 cm) of snow was recorded in Buffalo, but later it was blown to 30-40 ft (9 to 12 m) high drifts. The Northeastern United States blizzard of 1978 in February 1978, when Boston received 27.1 inches (69 cm) of snow, and Atlantic City received 20.1 in (51 cm). The snow, fallen electric wires and destroyed houses killed approximately 100 people and injured 4,500. The Storm of the Century, 1993, formed over the Gulf of Mexico, affected at least 26 U.S. states and Canada. It caused 69 in (180 cm) of snow on Mount Le Conte, Tennessee, 12-16 in (30-40 cm) in Alabama and even 4 in (10 cm) in northwestern Florida. 318 people perished during the storm. A storm in Lhünzê County, Tibet Autonomous Region, October 2008, dropping 5-6 ft (1.5-1.8 m) of snow within 36 hours. Seven people died and more than 1,300 people stranded by damaged buildings.